TV 3 didn't show the clip but TV One did have a clip about Hayley in the opening ceremony. So I joined both the Prime and TV One clips together. I used my video cam to film the TV and the result is not bad. With a bit more effort it should also work for the actual ceremony. Many thanks for the video, I'll post it on our Facebook page. 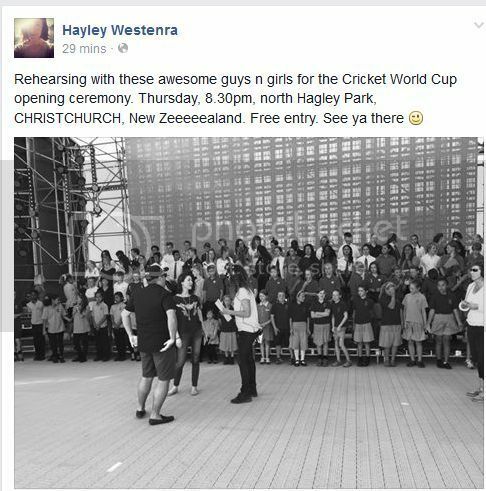 Hayley Westenra at a rehearsal for her Cricket World Cup 2015 opening performance. The opening ceremony for the Cricket World Cup will be packed with musical, theatrical and cultural performances from some of New Zealand's best-known cricketers and entertainers. Shapeshifter has today been announced as part of the musical section of the opening ceremony on Thursday, joining Sol3 Mio, Hayley Westenra and Ginny Blackmore. Former cricket captain Stephen Fleming will take part in the theatrical element of the show. He will be taking the stage with some familiar faces to tell the story of a young cricketer who dreams of making it big. Since seeing the stage set up in North Hagley Park the nerves had kicked in for Fleming, he said. "It's looking pretty impressive," he said. "Now I've just got to make sure I get my lines right." The event would finish with the biggest fireworks display to ever be held in Christchurch. The show on Thursday night will be followed two days later by the first game New Zealand v Sri Lanka on Saturday at nearby Hagley Oval. The free event will begin at 6.30pm with a giant game of backyard cricket, and the main event will then run from 8.30pm to 10pm. Hayley is on the front page of the Press today. Thanks very much for finding and sharing the good news about Hayley and the Cricket World Cup. Christchurch's year of cool in 2015 is making for some big weeks on the city's social calendar. This week may be the biggest. The big air of the Nitro Circus Live motocross tour descended on the Garden City last night. The gravity-defying exploits of its stuntmen would be the headline event in the city any other week. Either that or Kenny Rogers' farewell concert on Friday. Or the Foo Fighters' gig the following Wednesday. Even the Crusaders' Super Rugby opener this weekend could make a claim. The Cricket World Cup will deliver Christchurch a formidable one-two starting on Thursday with the tournament's opening ceremony in Hagley Park. The eyes of the cricket world will be on the city, and they will stay for the opening match between the Black Caps and Sri Lanka at the park's new jewel, Hagley Oval. 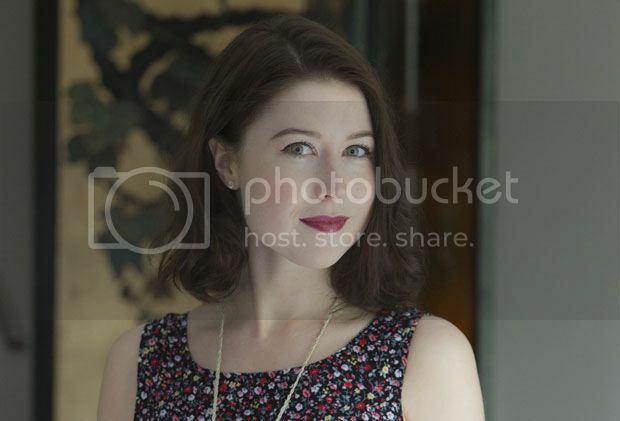 One of the stars of the week, Christchurch singer Hayley Westenra, graced Hagley's turf yesterday, offering just a hint of her coming performance. "It's very appropriate to be singing this song at this moment here in Christchurch," she said. Westenra and a 100-strong children's choir met for the first time to work on the secret song for the opening ceremony. Other events, including the kapa haka festival in March, will put a greater strain on Christchurch's resources but nothing will match the international exposure of cricket's showpiece. "[Christchurch] is going to be put the the test," Canterbury Employers' Chamber of Commerce chief executive Peter Townsend said. "And [it] will pass with flying colours." It already seems to be. South African cricket captain AB de Villiers, in town for a warmup match against the Black Caps on Wednesday, appeared convinced. De Villiers was in the Proteas side that jetted in and out of Christchurch in a day for a Twenty20 match against Canterbury on the first anniversary of the February 2011 earthquake. There were no jitters this time. "I love being here," de Villiers said yesterday. "It's great to be sort of part of the transition phase. "You see a lot of buildings under renovations. A lot of buildings smacked right down to the ground and people getting ready to rebuild everything." Thursday's opening ceremony will be a rebuild of sorts, returning the city to the global sporting consciousness. "Christchurch is back," former Black Caps skipper Stephen Fleming proclaimed yesterday. "This is a world tournament. It's a global opening and [we] have it on our doorstep in Hagley Park." The concert kicks off 8.30pm. Entry is free and open to all. Go if you can. It may be a while before we see anything else like it. That's what I call a video grabber. great...might use it on some old 8mm film I have from the fifties. Say hi to Hayley and send her best wishes for us here on HWI if you get a chance to meet up with her. I'm really starting to puzzle over what the Mystery song might be, our initial guesses might be wrong. Here is the official pdf brochure listing the full programme of events in Christchurch on Thursday, including road closures, parking restrictions etc. May be handy for Ross! New Zealand welcomes the 14 international cricket teams, followed by the official tournament opening. Entertainment includes Kapa Haka, music from Shapeshifter, Hayley Westenra, Ginny Blackmore, Sol3Mio, the New Zealand Army Band and a showcase of Christchurch and the Canterbury region. The night concludes with a concert and fireworks. I am still investigating the possibility of watching the ceremony online from the UK, via India (if Sky Sports still refuse to show it live at 7:30 am UK time) and if I can, I think I can record it too but it's all a bit uncertain at the moment so thank goodness Ross is able to do the job! 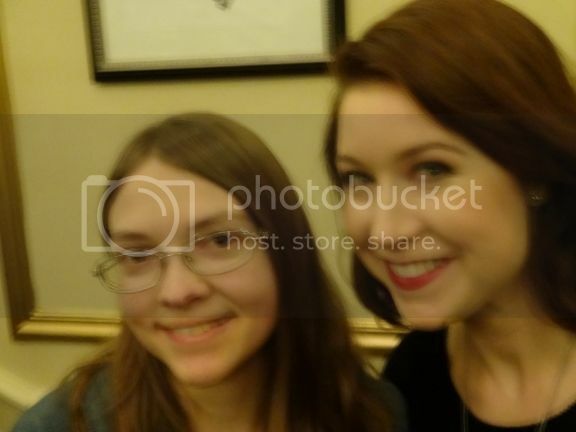 I've shared Hayley's photo on our Facebook page and added the link to the PDF file. Apparently the fine weather will not hold for the first match. I wonder if Hayley will attend anyway. I would imagine so. It's only a couple days later. It looks like most of the other matches are in NZ, too, though some are in Australia, of course. I am at the warm up game between NZ and South Africa in the Hagley Oval and I can hear the rehearsals for the Opening Ceremony. Cannot hear Hayley I think it is the other singers. Fine here today and tomorrow. Forecast for Saturday is more promising with maybe a chance of drizzle in the morning. This morning, Hayley was interviewed by Chris Lynch of Newstalk ZB. Topics included the Rugby World Cup!